In Rogue Legacy you can be a color blind barbarian who has an unnatural fear of chickens. You can be a giant spelunker with vertigo or even a paladin with irritable bowel syndrome. Rogue Legacy might pull you in with its unique traits system, but what will keep you is the incredibly polished gameplay. For as punishing as Rogue Legacy might be, you’ll never want to stop playing; the game is just that fun. Dying is a fact of life. Luckily, your family will be there to avenge your death, even after hundreds of generations. Traits take on a major role throughout Rogue Legacy. With every death you’ll have to choose from one of three descendants, each with their own unique skills and traits. Each of your children will have an assigned class (paladin, barbarian, spelunker, hokage, lich king, etc.) as well as their own set of traits. Color blindness, near and far sighted, vertigo, fear of chickens, dwarfism, or being gay are just a number of traits that you might find. While some traits have a larger impact on gameplay – vertigo turns the screen upside down and dwarfism allows your character to fit into tight places – other traits are meant as jokes or simply do nothing major at all. Eventually you’ll learn that pros and cons of specific traits and classes as you find that there are certain choices that usually work out best. For instance the hokage is capable of dealing massive damage, but is unable to take as many hits as say the barbarian who acts as the game’s tank. Gold runs are best served for the spelunker class as they automatically pick up a higher percentage of gold while also being rather weak. The castle itself is made up of various pre-constructed rooms that are randomly positioned next to each other. In some ways the layout setup is similar to something like Castlevania while the gameplay might seem reminiscent of Ghouls ‘n Ghosts. 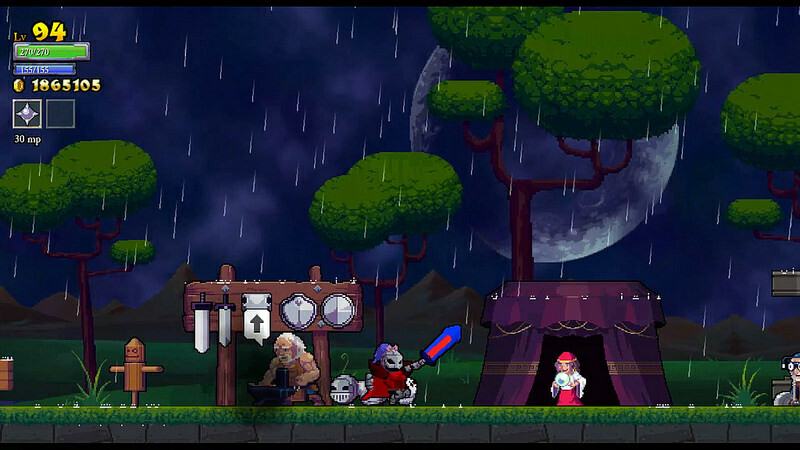 More than anything else what makes Rogue Legacy so good is the fact that the game controls so perfectly. Everything feels responsive. The game might ask some crazy things of you in certain challenge rooms, but you’ll never feel cheated. You die because you screwed up. As punishing as it is, Rogue Legacy is very easy to pick up and play, making it extremely difficult to put down. The lifespan of one character probably won’t last more than a few minutes, which leads to hours of saying “just one more run”. 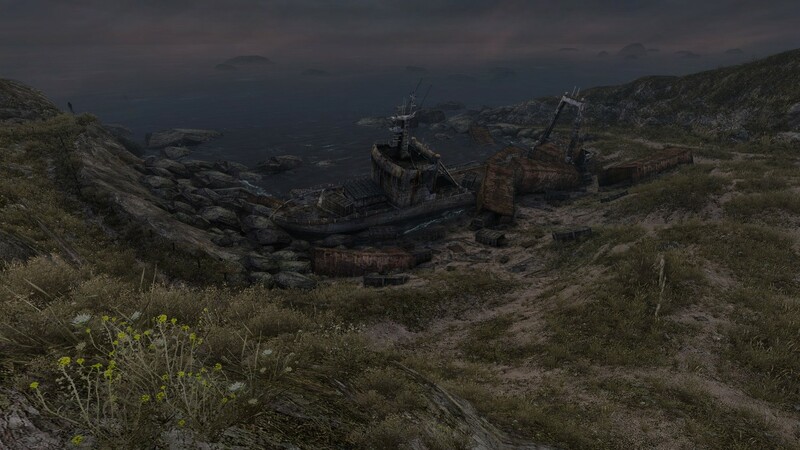 The castle is filled with secrets and challenges. You might find a room with a jukebox that allows you to cycle through the game’s soundtrack (which is easily up there with some of the best game soundtracks of recent memory), a cheapskate elf, or a very sad clown. There are a number of rooms that contain a “Fairy Chest” which asks that you complete a specific challenge in order to earn its rewards. You might need to defeat all enemies in the room, get to the chest without taking damage, or finish the room without jumping. If successful you’ll earn a special rune that can be later used to unlock new abilities through the enchantress. 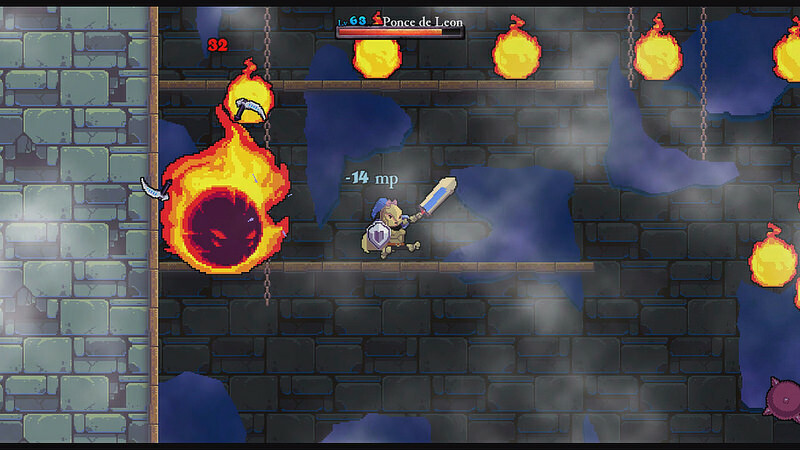 The PS4, PS3, and Vita versions of Rogue Legacy come with extra content that was patched into the PC version of the game after its release. This content features a new character class, new traits, and remixed boss fights. The remixed fights are extremely challenging and the new traits have managed to put a rather large smile on my face. Last year Rogue Legacy completely caught me off guard and blew me away. It was easily one of my favorites from 2013 and I wouldn’t be shocked if it continues to be a personal favorite for this year as well. This is the rare game that I actually go back to; one that I don’t see myself ever putting away for good. As often as I tend to finish a game in a few days and move on from it, I just don’t see that being the case with Rogue Legacy. One year later and I’m still just as excited about it as I was on my first playthrough. The more I play, the more I continue to love Rogue Legacy. I’m starting to notice tiny little details that show an immense amount of care went into designing every little part of this game. Cellar Door Games knocked it out of the park and Abstraction Games have done a stellar job at porting it over to PlayStation systems.